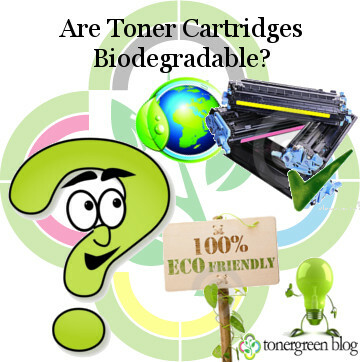 Are Toner Cartridges Biodegradable? | TonerGreen - Eco-Friendly Toners from the U.S.
Have you ever wondered if those toner cartridges you use in your laser printers are biodegradable? What is the meaning of biodegradable in the first place? Biodegradable is a term that connotes anything capable of decaying or breaking down into compounds after a reasonable amount of time such as paper, organic waste, and green waste that are subject to decomposition. Toner cartridges, however, can't be classified fully as something biodegradable though some of its toner components are composed of biodegradable materials; the whole toner cartridge itself is made out of plastic created from engineering-grade polymers that takes at least 1,000 years to decompose. According to Stop Waste Organization composition can be constructed as 40% plastic, 40% metal and a remaining 20% of varied materials like paper, foam, rubber and toner. The good thing though is that even if toner cartridges are non-biodegradable, 97% of its components are recyclable and can be reuse. This is where third-party cartridges manufacturers and OEM manufacturers' recycling program comes to view. They offer customers to exchange their used cartridges for gift certificates to use these empty cartridges for recycling. This process is more popularly known as remanufacturing wherein technicians with the help of machines inspect, clean, refurbished and re-fill the empty cartridges for re-sale. These recycled toner cartridges are more popularly known as remanufactured toner cartridges. With their connotation of being "recycled", these toner cartridges are sometimes referred to as "eco-friendly toner cartridges" as well. Another good thing about these remanufactured toner cartridges is that they help reduces the use of raw materials taken from our natural resources such as oil. Just a fact, three quarts of oil is being used and burned in a single production of a toner cartridge. And by remanufacturing a dozen cartridges, one can save up to 36 quarts of oil. At TonerGreen.com, we offer top-notch quality remanufactured toner cartridges that are made in the US. Our remanufactured toner cartridges are quality-tested to ensure they meet up to the print quality and performance of their OEM counterparts. We provide an exclusive supply of these remanufactured toner cartridges printer brands like Brother, HP, Canon, Dell, Lexmark and Xerox. All our products are covered by 2-year warranty. Aside from that, when you buy your ink and toners from TonerGreen,1% of your purchase is donated to EarthShare an organization dedicated to connecting people to environmental nonprofits through workplace giving, volunteer opportunities, and environmental education.